Faced with economic headwinds, many global corporations are struggling to grow their businesses profitably. In the consumer packaged goods business, for example, the worldwide recession has hurt premium brands as consumers have traded down to cheaper brands, private labels, or generics. In the retailing business, same-store sales are flat or declining for numerous companies. Meanwhile, many business leaders continue to seek growth by extending their existing product lines and brands, as well as by entering new geographic regions. After all, growth is supposed to be about “more” — more products on the shelf, more categories, more brands, and more markets. However, this approach is exactly the opposite of what business leaders should do to drive increased revenues and profits. A typical “growth through more” strategy diffuses the organization’s efforts. It increases the complexity of the organization and its operations. We have found that “growth through less,” or more precisely “growth through focus,” is the best prescription for growth, regardless of the economic environment. This conclusion is based on our own experience in three well-known companies — Kraft Foods, Unilever, and Fonterra Brands (a dairy products business based in New Zealand) — on three continents over 10 years. In all three cases, a deliberate strategy of focusing on a few markets, brands, and categories produced impressive revenue and profit expansion. We have learned that seemingly mature businesses can be energized by making fewer but larger bets and by focusing relentlessly on executing a simple but powerful vision. Growth through focus is not as easy as choosing what strategic bets to make. Rather, it requires the leadership team to follow a systematic approach that spans everything from strategy and vision to execution and measurement. We propose a framework that consists of seven steps that an organization must go through in its quest for growth through focus. Our framework is grounded in three key ideas: focus in strategy, simplicity in communication, and empowerment in execution. To understand the logic behind growth through focus, consider what winemakers know about getting the best out of grapevines. Grapevines are very vigorous. With abundant water and nutrients in the soil, they tend to grow into large, leafy plants. However, overly vigorous vines produce lower-quality wine and smaller crops. When growing conditions are too rich, grapevines grow more leaves and become tangled. Leaves take nutrients away from grapes, which contain the seeds for future growth, and create shade, which inhibits ripening. To improve the quality of grapes, winemakers carefully prune grapevines and remove excess bunches of grapes to reduce yields. The remaining bunches ripen more fully and ultimately produce more concentrated wine. Many companies, in effect, behave like inattentive vintners. Growth initiatives are often overstimulated with money and leadership attention. The result is lots of activity and a large number of growth projects, and this activity often does not correlate with outcomes. Quantity does not mean quality. To improve the quality of growth, business leaders need to cut back on marginal products, brands, and markets so that they have a better chance of winning in their chosen areas of focus. Following the winemaker’s logic, company leaders must overturn conventional thinking about how to manage the organization, processes, and people for growth. (See the exhibit.) For example, a conventional core belief about growth is that companies need to extend their product lines and brands and to expand their categories and markets. Leaders hope that the more arrows they have in their quiver and the more targets they have to shoot at, the more bull’s-eyes they will score. But in reality, growth often comes from fewer but stronger arrows aimed at fewer targets. The engines of growth are focus (fewer brands, fewer categories, and fewer markets) and simplicity (simple vision, simplified execution, and simpler organizational designs). Conventional thinking also assumes that although complexity adds cost and makes the organization less agile, it is inevitable in a large global company. But complexity is an avoidable enemy of growth if you know what you are doing. 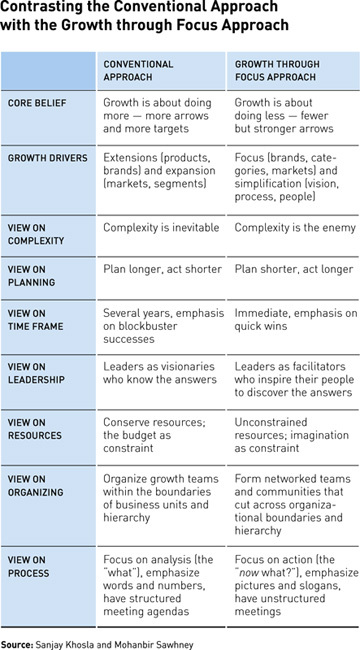 The logic of growth through focus also suggests a very different view on planning and leadership. Many companies tend to make long-term strategic plans, but they often have a short attention span in execution. CEOs and business leaders get seduced by doing something new and different well before the strategy has had time to play out. We recommend the reverse: Plan quickly and then stay the course for a long time, as long as five years. Leaders should resist the temptation to change strategies too often. Our experience suggests that growth through focus requires the organization to progress systematically through a set of seven steps: discovery, strategy, vision, people, execution, organization, and metrics. Taken together, they represent a powerful formula for driving profitable growth. Science fiction author William Gibson observed, “The future is already here. It’s just not very evenly distributed.” And so it is with excellence. All large companies have pockets of excellent growth performance. The first step in the growth journey is to discover what is working well and where the company is already winning. These pockets of excellence help identify focus areas for growth. An effective way to uncover what works is to conduct a series of workshops with the top leaders from the company. At Unilever’s Lipton beverages business, the process began at Colworth House, the company’s R&D center in the United Kingdom. The top 100 leaders of Unilever beverages from around the world were invited to a workshop in 2000, whose agenda was to build upon what was working well in specific markets and to scale the success across other geographies. One year later, this was followed by a “10 in 10” workshop in Brussels to discuss how to achieve sales of US$10 billion within 10 years in these markets and to imagine the future of Lipton as seen through the eyes of Unilever’s major competitors. In Kraft Foods’ international business, the growth process kicked off in 2007 with seven workshops in six locations around the world, each including about 20 of the company’s regional business leaders. The agenda was open-ended, with the top leaders taking a backseat to prevent their rank from impeding the flow of ideas and insights. An external facilitator ensured that collective experience was gathered objectively. The workshops focused on what worked rather than on what did not work, because it is easier to build on what is working than to fix what isn’t working. To ensure a customer focus, workshops included extensive immersion with consumers and customers to provide insights into behavior, needs, and problems. This kind of immersion generates insights in ways that quantitative market research never can. A few themes began to emerge from the workshops. Kraft Foods had excellent people, but their insights and ideas had been getting lost because of geographic dispersion, and their potential was not being fully realized. The company’s iconic brands had been built over many years, but several were underperforming. The planning process had tended to focus internally instead of externally, and had looked backward rather than forward. There was a lot of emphasis on analyzing what happened instead of figuring out what needed to be done. The conclusion was clear. The company urgently needed to establish clear priorities and accountability at a global, regional, and local level. At the outset, the discovery process should be inclusive and democratic. It is important to involve key stakeholders within the company, particularly those who can make a valuable contribution and those who have the influence to get the masses of employees behind them. In addition, great insights often come from engaging with suppliers, creative and media agencies, and consultants who have worked with the company for a long time. On the other end of the spectrum, it is also important to listen to people who push back — and to manage dissent. As the process goes on and the framework and vision are agreed upon, debate on the strategic framework should cease and the emphasis should switch to execution. The discovery process produces a set of success themes. In the second step, these themes need to be clustered and prioritized to define the focused bets that the company should make. Narrowing the focus is essential in order to concentrate resources on areas where the company has the best chances of winning. To take an analogy from photography, sharpening the focus on an object requires a telephoto lens that homes in on the subject while de-emphasizing background objects. Similarly, we have found that strategic focus requires lenses through which a company can look at its businesses. Lenses can be categories that the company is doing well in, brands that are performing well, geographies that are doing a stellar job, and platforms (like wellness or bone health in healthcare) that can serve to unify the company’s products and brands. Consider the experience at Fonterra Brands. Through the discovery process, the company used two lenses — a product platform and a distribution channel. Using the platform lens, Fonterra identified osteoporosis as a key platform to bet on, based on its expertise in bone-health products. To pursue leadership on this platform, Fonterra entered into a partnership with GE Healthcare’s Lunar business to tackle the growing global health problem of osteoporosis using Fonterra’s Anlene bone-health products and GE Healthcare’s bone density technology. The partnership’s first initiative was the Anlene Bone Health Check, which provided free bone density screenings to millions of people in nine countries in Asia. Using the second lens, Fonterra bet on the food-service channel as a key to its future growth. The outcome was a focused business called Fonterra Foodservices, which offers a complete suite of dairy products and tailored solutions for food-service professionals. Focusing through the distribution channel lens led to the strategy of creating a single “cow to customer” integrated business. During the focusing process, each lens may produce several possible opportunities. These opportunities should be prioritized according to two criteria: the expected impact of the initiatives and the effort required. This exercise should result in a one-page preliminary plan that lists priorities for each lens. This preliminary plan should then go through several rounds of iteration with the input of key stakeholders. To improve the framework’s odds of adoption, it is important to involve as many of these stakeholders as possible in “owning” the outcome. Once you find out what works, you can focus on it and scale the success to other markets, products, and brands. In the Unilever workshops, the company discovered that Lipton Portugal and Lipton Arabia were performing consistently well over time. Diving deeper into the reasons for this standout performance, the company found an interesting theme. In both markets, Lipton had been successful because it competed in the broad beverages market rather than limiting itself to the tea category. Further, in these markets, Lipton had done an excellent job of adapting its products to local tastes. For instance, Portugal had a successful iced tea business, whereas Arabia represented a successful hot tea market, despite the fact that Arabian countries have hot climates. The idea of taking a broader view of the business while remaining relevant to local tastes could be applied to Lipton’s other markets and categories. Once the focus areas have been defined, the findings need to be summarized in a compelling yet simple vision. The vision serves as a rallying cry for the organization to align its efforts behind a clearly understood goal. Too frequently, the business strategies of large corporations are poorly understood outside the corporate headquarters and beyond the senior leadership of the company. To get everyone in the organization behind the strategy, it is vital to communicate the strategy across all levels and functions in the organization. This is the role that the vision plays. To make the vision compelling yet easy to understand, we recommend creating a “hook.” The hook should be kept consistent over time and across customer touch points. It can be a color, a number, an acronym, a phrase, or a symbol. At Fonterra, the rallying cries were “Winning through Brands” and “Dairy for Life.” The vision embodied two themes: farmers’ pride (Fonterra is a cooperative owned by farmers) and the company’s emphasis on natural products, captured through the blue and green color of the company’s logo and merchandising. At Kraft International, the vision was expressed in numbers — “the 5-10-10 strategy,” which meant winning by focusing on five categories, 10 brands, and 10 markets. At Lipton, the vision was “Paint the World Yellow with Lipton.” The brand’s characteristic color signified brightness and sunshine, and stood for a broader Lipton beverage experience than just a cup of tea. Once a vision is chosen, it needs to be launched with a bang through a seminal event designed to inspire the team. For Kraft Foods’ international business, the top 100 leaders were brought together on the 99th floor of the Willis (formerly Sears) Tower in Chicago in May 2007. The event kicked off with awards for teams around the world that recognized great work in various categories. Awards can set a positive tone, instill a can-do attitude, and make people feel like winners. At Lipton, the kickoff event was held at Colworth House, the 18th-century mansion at Colworth Science Park, where everything was painted yellow — including the lawn in front of the building. The theme “Paint the World Yellow with Lipton” was brought to life through winning stories from successful markets. In communicating the vision, pictures are often worth a thousand words or PowerPoint slides. Simple visuals that depict the “from–to” journey can serve as powerful communication tools. Lipton used two visuals to bring the transformation journey to life — a picture of Audrey Hepburn, representing the Lipton brand as it was (classic, aristocratic, reserved), and a picture of Cameron Diaz, representing the new Lipton (bright, sunny, vibrant). Once the vision and strategy have been defined and powerfully communicated, the next step is to find the right people and to place disproportionate resources in their hands. The right people need to be placed in all functions — supply chain, R&D, marketing and sales — to ensure that you have the skills to win. Selecting those people requires a rigorous process of matching skills with the needs of the business. For instance, if the strategy involves focusing on a specific channel or set of brands, you need to find people who have expertise in the relevant channels and brands and put them in charge. In Kraft Foods’ international business, significant changes were made in the top leadership. Less than two years after launching the transformation initiative, two-thirds of the top 30 leaders were new to their roles. Many of the new leaders came from within Kraft Foods. Some were hired externally, and some came from the successful acquisition of Groupe Danone’s biscuit business in November 2007. Similarly, at Lipton, a number of managers were hired from leading companies in the beverage industry (Coke, Pepsi, Schweppes) to augment the traditional grocery skills within Unilever. Once new leaders are appointed, they need to be given the freedom to operate within the strategic framework so that their potential can be truly unleashed. Leaders should be challenged to act as entrepreneurs within large companies that have traditionally been perceived as process-driven and bureaucratic. In our experience, the biggest enemy of creativity and imagination in large companies is the budget. Resource constraints, real or perceived, limit the imagination of business leaders and prevent them from thinking creatively. To liberate people from these constraints, we recommend a counterintuitive approach: Give people huge targets and empower them with virtually unlimited resources. The targets should represent a quantum leap from historical results. Although it may seem that unlimited resources would encourage profligate spending, business leaders have a strong incentive to spend wisely, because they do need to deliver profits and margins, not just revenue increases. When leaders are asked to act like owners, they behave with an amazing sense of responsibility and often arrive at sensible trade-offs among risks, rewards, and resources. It is important that leaders not be penalized for failure unless they consistently fail to learn from experience. Unleashing the potential of people also involves identifying and nurturing tomorrow’s growth leaders. During Kraft Foods’ transformation journey, a formal program called the Winners’ Circle was created to recognize and reward performance and potential in the international business. This program was designed after benchmarking against some of the world’s best companies. Rising stars from around the globe were nominated through a rigorous selection process, and the Winners’ Circle members were inducted into a leadership program designed to build their capabilities. Today, their career progress is carefully monitored and they are selected for challenging growth assignments across the company. The program has generated tremendous buzz within Kraft Foods because of its richness and depth. With the discovery, strategy, vision, and people in place, the next challenge is execution. This is the most important step in the journey, and it is also the most difficult. Execution has two key elements. First, everyone needs to be clear about who will do what, to avoid ambiguity about roles and responsibilities. Second, decision making needs to be moved closer to customers and consumers so that the people responsible for results have the operating freedom they need. Most organizations have a mistaken conviction that the leadership team has superior knowledge on every subject. This belief conditions managers to assume that success lies in pleasing the leadership team rather than in winning in the market. Kraft Foods found that the organization had become such a complex matrix that accountability was fragmented across functions, markets, and business units, yet decision making had become highly centralized. Decisions such as product pricing were being made at corporate headquarters, which took longer and excluded the rich knowledge and context of local markets. Even such routine decisions as the pricing of coffee in Germany were made at the corporate headquarters in Northfield, Ill.! This was changed to give business leaders the freedom to make decisions that would allow them to compete effectively in their markets. The role of corporate headquarters was made more strategic and less operational. Certain decisions involving food safety and purchasing were still kept centralized because they had to be made on a large scale, as opposed to those that demanded intimacy with local consumers and customers. These changes have had a profound effect in making the organization more nimble. To accelerate execution, we recommend a strong bias for action. Business leaders should demand a dramatic reduction in internal documents and meetings. In our experience, too many meetings and documents foster analysis paralysis, promote internal focus versus external focus, and emphasize the past over the future. Much of the documentation is generated to please senior management, with endless hours spent on “wordsmithing” and editing. For the most part, we suggest a “no PowerPoint” policy in presentations; meetings are often far more productive if they focus on discussion based on pre-reading. Numbers may help tell the story, but too often, we find that numbers become the story and the big picture gets lost. Growth initiatives rarely fit within organizational silos of function, geography, and business unit. Rather, they need to be managed by creating communities and networks across the company, formal as well as informal. At Kraft Foods, certain networks, such as R&D, have always been strong. However, as business units were pushed to take P&L responsibility, it was important to set up collaborative networks to ensure that the best people with the best ideas were connected to leverage expertise and scale. Kraft Foods set up global category teams consisting of executives drawn from different functions and geographies to manage global brands, innovation, and supply chains across markets. Each team follows the approach that works best for its brand or category in terms of what needs to be done by whom, globally or locally. Consider the example of Oreo cookies, one of Kraft Foods’ billion-dollar brands. Oreo was a strong brand in the United States but had historically been weak in the rest of the world. One reason was the assumption that what was good for Oreo in the U.S. was also good in China, the U.K., and elsewhere. The company learned from experience that this was not the case. To grow the brand in China, Oreo cookies were made less sweet to suit local consumer tastes. Oreo packages were made smaller, and new forms, like wafers, were introduced. Heavy emphasis was placed on local promotions and on-the-ground marketing activities unique to China. This localization, however, was carried out within the global brand positioning for Oreo. After implementation of the new strategy, Oreo became the market leader in China, and the Oreo business outside the U.S. began growing about 30 percent per year. Through the global category teams, Kraft Foods now has an energized, highly motivated community of employees around the world who sleep and dream Oreo. This approach of matching skills with priorities and connecting communities to get the best mix of global and local ideas, within a clearly defined strategy, has a powerful effect in leveraging scale and expertise. As the execution and organization processes get under way, it is important to keep score. Scorecards should be objective, and they should be kept simple. Overly complex metrics take attention away from the measures that really matter and can obfuscate execution priorities. At Kraft Foods, Chairman and CEO Irene Rosenfeld asked that the businesses create a one-page scorecard system that included three key measures — sales, profits, and cash flow. These three measures were made the basis for bonuses to all employees. This simple scorecard dramatically reduced reporting complexity and created clear accountability for results. Kraft Foods’ international business also uses a single-page scorecard to monitor the progress of the 5-10-10 strategy. Simplicity begets focus, because everyone knows what numbers the executives are looking at. Managing growth requires a focus on numbers, but numbers alone are not enough. Storytelling is a powerful tool for propagating the culture of winning in the organization. A conscious effort should be made to write up and disseminate success stories from around the world. Leadership should make it a point at every large internal meeting to put successful people on the stage to share their stories with their colleagues. Success stories become part of the culture, and successful people become heroes in the eyes of their peers and managers. Moreover, highlighting the achievements of successful teams creates “positive shame”; the teams that are not on the stage feel strong peer pressure. This positive pressure is far more effective than the “negative shame” that would be created if the less-successful teams were berated in reviews. With any transformation initiative, there are pitfalls to avoid and hurdles to overcome on the way to success. Here are a few to keep in mind in implementing growth through focus. One common pitfall is to seek to build scale before fixing underlying problems. In choosing the markets and categories to focus on, for example, it is easy to get seduced by the size of the opportunity. Most large companies covet the hundreds of millions of consumers in emerging markets such as China, India, and Brazil. And they quote the minuscule per capita consumption of their products as an indicator of vast untapped potential. To convert potential into actual revenues and profits, however, you first need a business model that works. You must have the distribution reach, the supply chain, the manufacturing capabilities, and the right products before you can scale the business. Kraft Foods was in China for many years and had set ambitious targets that it did not achieve. In reality, the model was not working and the business was losing money. Scaling up the model simply made things worse. To fix this problem, Kraft Foods redesigned its business model, integrated its business with the acquired Danone biscuits unit, and got the appropriate talent on the ground. Only then did Kraft Foods’ business in China begin to grow and make money. Another potential trap in implementing growth through focus is neglecting or mismanaging the parts of the business that do not fall within the core focus areas. This is the “tail” of your business — products, brands, categories, and markets that do not make it to the priority list. Consider, for example, the brand portfolio. Most large companies have hundreds of brands, but only a few will make it to the priority list. So what should you do with the rest? Simply cutting off the tail can be disastrous, because the decline of the tail is often faster than the growth of the core. Further, the non-core businesses often have fixed costs that are linked to the core businesses. Finally, cutting and divesting can have a huge demoralizing effect, because people often have strong emotional ties to some of these businesses. What you need is a clear plan to manage the tail. We find it helpful to cluster the non-core businesses into two buckets — “milk or divest” and “local jewels.” The two buckets need very different management approaches. The first category includes businesses that do not make money and have no hope of making money, despite repeated promises of future turnarounds. These need to be divested over a defined time frame. Fonterra Brands exited markets such as Mexico and Egypt where the business had not performed well for some time, which freed valuable resources that could be redeployed to grow the core businesses. Local jewels are successful local businesses that can be retained in the portfolio but managed at arm’s length by local teams, leaving the global teams to focus on the core businesses. At Kraft Foods, the company found a number of such jewels that are now managed locally, but still help to provide scale in manufacturing and distribution. These businesses should be left to determine their own destiny but should be held accountable for revenues, margins, and cash flow. Too often, when companies rationalize and focus, they slash expenses across the board. Two areas that take the brunt of cost cutting are people-related expenses (recruitment, training, travel) and brand advertising. However, talent and brands are the two most valuable assets for driving growth. We recommend increasing investments in hiring and developing talent, even ahead of the company’s needs. We also recommend increasing investments in building brands. The good news is that the growth-through-focus approach yields significant cost savings through elimination of management layers, reduction of overhead, and elimination of marginal businesses. Focus frees up resources that can be used to invest in the future. Once a strategic direction has been established, it is important to stay the course until the strategy has been fully implemented. We find that large companies suffer from “corporate attention deficit disorder” — they tend to search for new strategies every few years, particularly after a change in leadership. But growth through focus requires patience and perseverance. In our experience, the transformation process takes as long as five years to play out. Leaders should resist the temptation to go for the “next big thing” in strategy peddled by management consulting firms and management gurus. Change for the sake of change merely produces a loss of momentum. Finally, keeping a positive tone is vital to the success of growth through focus. It is very easy to slip into a negative spiral that can destroy morale and derail the transformation initiative. Although you do need to face the facts and make the difficult decisions, it is important to keep a positive tone and to promote a can-do attitude among employees. The energy that comes from winning is infectious. It inspires people to achieve goals that they have never before considered possible. Leaders should act as evangelists and cheerleaders, spreading the positive energy and making sure the teams are having fun at winning. The sun generates a tremendous amount of energy, but it gives us only a warm glow. By contrast, a laser beam that uses a few kilowatts of energy can cut through metal. Such is the power of focus. If you are running a large global business with a big portfolio of brands, products, and markets, adding to your portfolio is likely to create more complexity than growth. To win in your businesses, you must harness the power of focus. By following the seven steps in our blueprint, business leaders can drive profitable growth even in difficult economic times. Growth through focus involves a reduction in the number of products, categories, brands, and markets that the company should focus on. But it also demands an increase in the scale of the businesses that the company chooses to focus on. Scale can be generated by building on the brand and product assets that the company has in its portfolio through organic growth. However, organic growth may not be enough to get to the required scale, particularly when the company is betting on markets or categories in which it is not a market leader. Further, in some emerging markets, building distribution networks from scratch is a Herculean task. This is where acquisitions play an important role in the growth-through-focus approach. They can help the company acquire scale in its chosen domains. The acquisition strategy should be driven by the focus strategy, and a clear logic should link the acquisition to the strategic framework for growth. Consider Kraft Foods. The company had chosen biscuits and chocolates as two of the categories it wanted to focus on. It had also determined that markets like India, China, Brazil, Russia, and Mexico would be important for the company in the future. However, it lacked the scale, the brands, and the distribution networks it needed to compete globally in these categories and these markets. Using this focus strategy, Kraft Foods identified two key acquisitions — the global biscuit business of Groupe Danone and Cadbury PLC, the U.K.-based confectionery company. In November 2007, Kraft Foods acquired the global biscuit business of Groupe Danone for US$7.8 billion. After this acquisition, Kraft Foods’ biscuits business accounted for 20 percent of the company’s revenue and catapulted Kraft Foods into the leading position in this category across the world. More importantly, it gave Kraft Foods an engine for faster growth in emerging markets. And in February 2010, Kraft Foods completed the acquisition of Cadbury for $19.5 billion, which has made the company a global powerhouse in snacks, confectionery, and quick meals. Kraft Foods now has access to Cadbury’s strong international distribution networks, which will allow it to penetrate deeper into emerging markets. The focus lenses chosen in the second step of our approach can be used to identify and prioritize acquisition targets. In the case of Kraft Foods, the Danone biscuits and Cadbury business were attractive targets because they represented a triple win on the 5-10-10 scorecard — priority categories, strong brands, and strong presence in the key markets that Kraft Foods had decided to focus on. Further, these acquisitions brought in talent and a diversity of culture that will be a powerful asset for Kraft Foods as it grows its international business. Sanjay Khosla is president of Developing Markets and Global Categories for Kraft Foods. He has more than three decades of leadership experience in global consumer packaged goods companies and has lived and worked around the world. Mohanbir Sawhney is the Robert R. McCormick Tribune Foundation Clinical Professor of Technology and director of the Center for Research in Technology and Innovation at Northwestern University’s Kellogg School of Management. He has coauthored five books and many articles on marketing, technology, and innovation. Irene Rosenfeld et al., “Inside the Kraft Foods Transformation,” s+b, Autumn 2009: A roundtable discussion of Kraft Foods’ overall corporate reorganization. Mohanbir Sawhney, Sridhar Balasubramanian, and Vish V. Krishnan, “Creating Growth with Services,” MIT Sloan Management Review, January 15, 2004: Perspectives on how companies can drive organic growth through services.